These mice contain a global knock-out of the sulfonylurea receptor (Sur1), which is part of the ATP-dependent potassium channel. In humans, mutations in Sur1 cause persistent hyperinsulinemic hypoglycemia of infancy (PHHI). 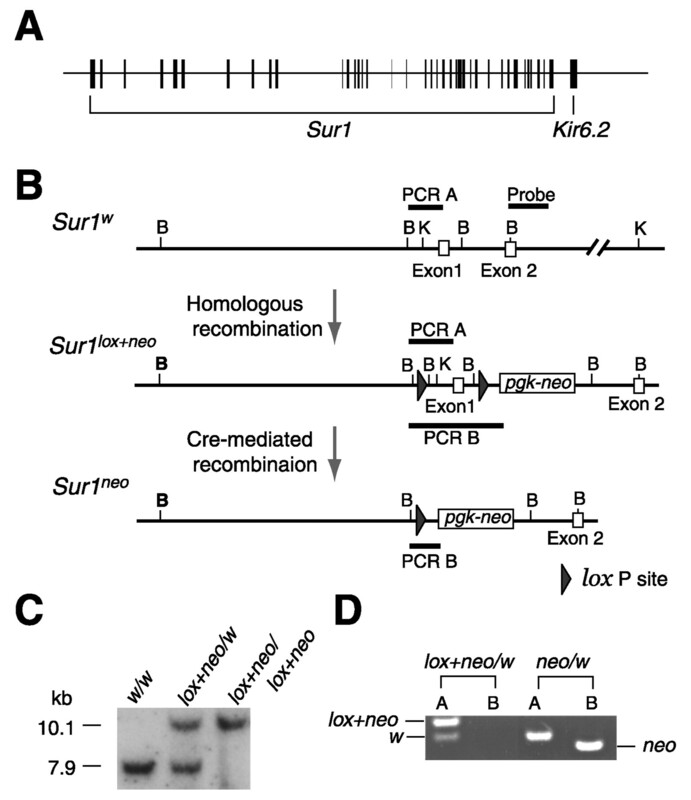 A gene targeting strategy that involved the use of Cre/loxP was used generate mice that globally lack the proximal promoter and exon 1 of the sulfonylurea receptor type 1 (Sur1) gene. A pgk-neomycin resistance gene remains in the locus. Genotype: DNA PCR utilizing 5'-CAA TTC CTC AAC TGA GGC TCT TAA-3' and 5'-AGC CTC TGT TCC ACA TAC ACT TCA-3' primers amplify a 414 bp Sur1[neo] allele. DNA PCR using 5'-CAA TTC CTC AAC TGA GGC TCT TAA-3' and 5'-TCG CAG AGT GAC CTC ACA GCC TGT-3' primers amplify a 412 bp for the wild type allele. Homozygous phenotype: Mice that are homozygous null for Sur1 (Abcc8) are viable, fertile and grossly indistinguishable from their wild type littermates except after 16 wks when they become mildly hypoglycemia. Mice lacking Sur1 (Abcc8) lack functional K-ATP channels in pancreatic beta cells but remain euglycemic despite having beta cells that are constantly depolarized due to the lack of this protein. Heterozygous phenotype: These mice are also viable and do not differ from wild type. After achieving germline transmission mice carrying the Sur1[neo] allele were backcrossed for ten generations.